Leicester City scrapped their way to a 3-1 victory over Derby County in an FA Cup fourth-round replay on Wednesday night, but it was far from plain sailing. 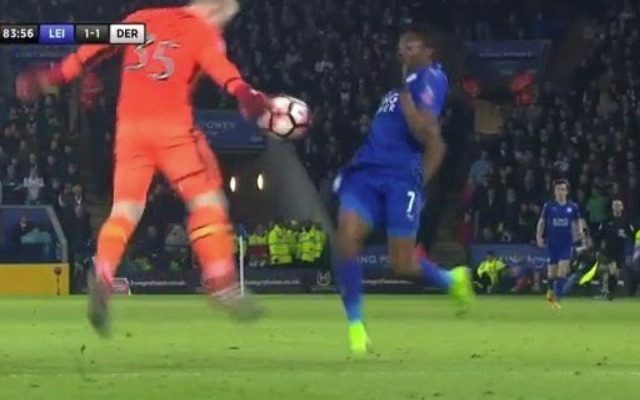 The Foxes were taken to extra time at the King Power Stadium, where referee Mike Jones played the role of chief villain. Jones failed to award a free kick for this handball by Derby goalkeeper Jonathan Mitchell, who should have been sent off. As Mitchell sheepishly returned to his goal, Leicester forward Ahmed Musa was shown a yellow card for dissent as he protested the ref’s non-decision. This all happened after a deflected Abdoul Camara strike had cancelled out Andy King’s opener. Wilfred Ndidi and Demarai Gray then netted in extra time to book Leicester a last-16 trip to Millwall. Had the game still been level after 120 minutes, it would have been decided by a penalty shootout. However, referee Jones was seemingly not in the mood for any spot kicks as he waved away several strong penalty appeals during a busy night. Fans took to Twitter to critique Jones’s performance and the general feedback was far from complimentary. Mike Jones should be sacked after this performance.Cant remember a ref get so many clear cut decisions wrong.Wonder if @FA will do anything? Mike Jones is the worst referee in the country.